Leading Borussia Dortmund to two straight Bundesliga titles wasn’t enough to even earn keeper Roman Weidenfeller a nomination for the German national team. Borussia Dortmund can thank their goalkeeper Roman Weidenfeller that they picked up a 1-1 draw in their showdown against Bayern Munich. The 32-year-old’s showing was so impressive that he gained national television support for the German national team. Weidenfeller may have guided Dortmund to the last two Bundesliga titles, with the team having conceded only 47 goals in total over the two campaigns, but that hasn’t resulted in even a single nomination by Germany boss Joachim Löw. The Diez native has never been nominated for Germany’s senior team after playing at the 1997 U17 FIFA World Cup and also earning caps for the German U21 team. Weidenfeller has shown over the years he is a world class keeper. And that was on display again against Bayern. After his team had knotted the game a 1-1 in the 74th minute, Weidenfeller barely batted over his bar a lofting ball by Thomas Müller in the 85th minute and then stopped Toni Kroos a minute later before deflecting just wide Javi Martinez’s header in the 89th minute. “Weidenfeller was great in the end, just like so often. I don’t know what the guy needs to do to play internationally,” said the Bayern coach Jupp Heynckes after the game. “Roman is extraordinary and sometimes he is disappointed that the can’t play for Germany,” added Dortmund coach Juergen Klopp. Former Germany keeper Oliver Kahn said Weidenfeller not playing for Germany is a matter of perspective for Löw. “Löw has young keepers like Manuel Neuer and Rene Adler. And that’s the way he wants to go,” Kahn told the German sports channel Sky. Weidenfeller was especially disappointed August 2011 when Hannover’s 22-year-old keeper Ron-Robert Zieler was nominated as Germany’s third keeper behind Neuer and then Bremen keeper Tim Wiese despite having played only 18 matches in the Bundesliga. 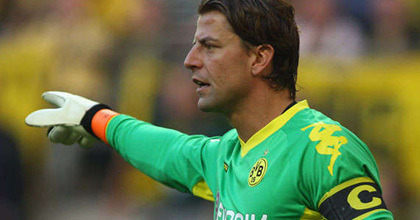 “Maybe I should announce my retirement before I have even played,” Weidenfeller was quoted as saying.